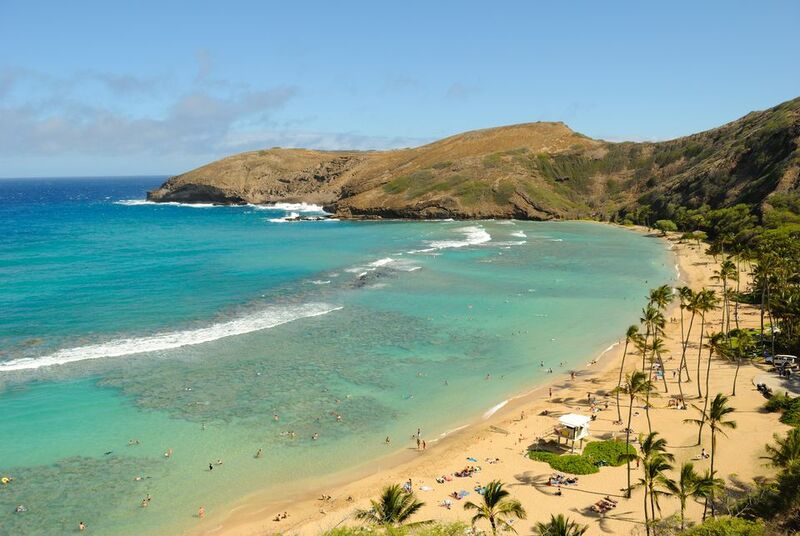 Many folks consider a visit to Hawaii a once-in-a-lifetime experience. These tropical islands support a diverse and fascinating culture unlike any you can find in the rest of the United States. While most visitors center their vacations on the famous beaches, the eight islands in the volcanic chain contain 10 of the world's 14 climate zones. On the Big Island alone, you can climb a volcano, get drenched in a waterfall, explore a black-lava desert or a tropical rainforest, and even play in the snow. For U.S. citizens, a trip to the islands requires only a little more preparation than a trip to any other state; foreign visitors must meet the requirements for entry to the U.S. The weather in Hawaii varies little during the year. The average daytime temperature hovers between the high 70s and mid 80s F. Locals consider winter the rainy season, but even in January, the month with the highest average rainfall, you typically see more sunshine than clouds. So the perfect time to visit Hawaii might just be whenever you can go. Do note, however, that nearly 9.3 million people visited the islands in 2017, so during the two peak tourist seasons from June through August and December through February when U.S. schools typically go on break, top attractions get more crowded and prices go up. Additionally, many Japanese take their vacations in late April and early May during Golden Week, so Waikiki gets more crowded at this time. The Merrie Monarch festival takes place in Hilo on the Big Island each year during the week after Easter, so you may wish to avoid the Hilo area at that time. Hawaii residents embrace a laid-back lifestyle and their clothing reflects this relaxed attitude. You rarely see a tie and or even a sports jacket on men. Casual clothing works for most resorts, restaurants, and entertainment venues, though men should plan to wear collared shirts for most evening outings and definitely on the golf courses. Women may want to wear skirts or dresses for comfort or fashion, but shorts are perfectly acceptable too. Pack a winter-warm layer, hat, gloves, and sturdy shoes if your itinerary includes hiking at any of the higher elevations or a trip to Mauna Kea or Mauna Loa on the Big Island or Haleakala on Maui, where you can find snow at the top. A light sweater comes in handy down below for cooler evenings and excessive air conditioning, and a rain jacket gets put to use all year long on the wetter windward side of the islands, which face the trade winds blowing through from the northeast. Entry requirements for Hawaii match the rest of the United States. U.S. citizens can visit the islands without a passport; Canadian visitors do need one. Citizens of countries requiring visas to enter the United States must meet those requirements to enter Hawaii. Mainland residents do not need any special vaccinations to visit Hawaii. Hawaii uses the standard US 110-120 volt, 60 cycle AC, so mainland residents traveling to the islands don't need to worry about bringing adapters for personal appliances such as hairdryers. Hawaii also uses dollars just like the rest of the United States. Most businesses in tourist areas accept all major international credit cards, including American Express, MasterCard, and Visa. You can find cash machines all over the islands, at banks, in hotels, and in convenience stores. You may pay a fee for withdrawing your money, however. Tipping in the islands works the same way as on the mainland, with 15 to 20 percent gratuity standard in restaurants. Baggage porters, taxi drivers, tour guides, and valet parking attendants, among other service-industry employees, also accept and usually expect tips. In the Hawaiian Time Zone, it's two hours earlier than in California and five hours earlier than in Philadelphia during the winter season. It's 10 hours earlier than in London. Hawaii does not observe daylight savings time, so during the summer months, it's three hours earlier than in California and six hours earlier than in Philadelphia. Pets traveling to Hawaii must remain under quarantine for 120 days, so the islands won't be the best destination if you can't be separated from your four-legged family members. The state strictly regulates the importation of plant and animal matter, and all visitors entering by air must fill out a declaration form listing any plant or animal products with them. Officials inspect all declared items. It's generally safe and acceptable to carry commercially packaged foods such as snacks or cooked, canned, or frozen foods into the state from the mainland.